Well, what a busy month May has been for the My Trusty team! Early in the month we were out and about meeting many of our loyal customers at the Downton Cuckoo Fair – what a fabulous turn out there was with an outstanding 19,000 people! We even managed to stay pretty dry too! We were so busy we forgot to take photos. Can you see our gazebo in the crowd? And we had a winner too! 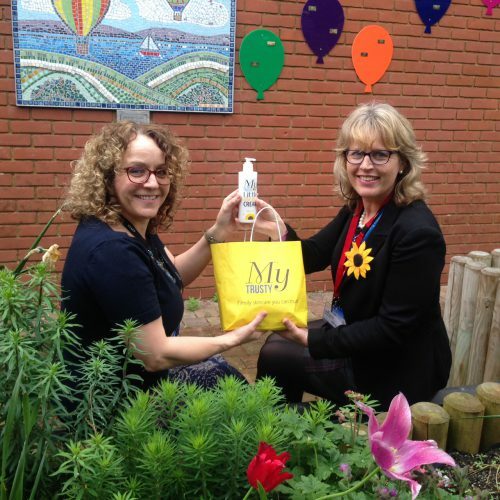 Here is My Trusty® Manager Linda Mace presenting the lovely Alison Murley, Head of Exeter House School, Salisbury, with her prize of 6 months’ supply of My Trusty® skincare. “I am very excited to win such a lovely range of skincare as I have never won anything like this before”, said Alison. Exeter House, Salisbury will be the first school in Wiltshire to sign up to an exciting new fundraising scheme with My Trusty® encouraging best practice in skincare. All the pupils were presented with a free skincare pack which included a 100ml sample tube of My Trusty Sunflower Cream –unscented, to try at home. And finally …. We would like to welcome our new family friendly wholesaler ‘Mawdsleys’, who are based in Manchester. This company just love our products and are busy spreading the word to all their retailers. If you know of a pharmacy, health food store or gift shop that you think would love to stock My Trusty – please do let us know. Wishing you all a Sunflower Special Bank Holiday.